Search engine algorithms are always changing—keeping content marketers on their toes. While most algorithm updates tend to be minor, Google will occasionally introduce significant changes that impact search results in major ways. The latest algorithm updates weren’t introduced because search engines want to penalize businesses and publishers. Searchers have changed the way they look for information. Today’s users query using conversational phrases—searching as they would speak. In fact, the increased usage of voice-activated search and mobile devices continue to push search algorithm changes forward. The tried-and-true content optimization tactics of yesteryear—local directory plugs, keyword stuffing and paid backlinking—are virtually rendered useless. HubSpot, a leader in marketing automation and digital business growth software, recognized this shift in the evolving search landscape. Today’s content publishers cannot solely rely on keyword-based queries or optimized meta descriptions to get ahead. Instead, marketers must create content that builds authority, cuts through clutter and appeals to modern searchers. This realization led to the establishment of the HubSpot Content Strategy Tool. The transformation of both search engines and searchers has forced marketers to change the way they determine their content strategy. One of the most popular, and effective, ways to increase search engine optimization (SEO) authority on your website or blog is through pillar pages and topic clusters. Content Marketing Institute defines a pillar page as a web page with considerable influence built around one broad topic. Each pillar page gains its authority from sub-topic pages—or topic clusters—that support the pillar by internally linking back to it. Generally, pillar pages are built around a term or keyword with a higher search volume or ranking difficulty. Instead of each individual page working towards ranking for one specific keyword, the pages work together through a variety of keywords surrounding one general topic. A pillar content strategy is only successful through a deliberate and well-organized site architecture. Each pillar page and its corresponding sub-topic pages should link back to each other, giving searchers easy access to all content on your website related to a larger subject matter. This methodical architecture helps establish subject expertise with readers while also giving your content a better shot at ranking higher with Google. HubSpot isn’t the first organization to champion pillar content strategy, but it is the first marketing automation platform to offer marketers a comprehensive tool to help engineer your SEO content strategy. 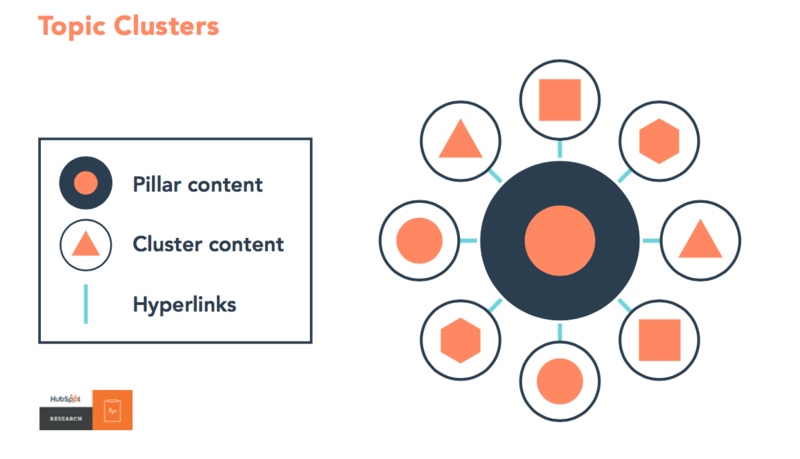 Since the success of your strategy relies heavily upon the effectiveness of your pillar content architecture, a well-organized topic cluster cannot be downplayed. HubSpot’s Content Strategy Tool allows marketers to plan, plot and analyze their pillar content strategy through a holistic vantage point. Below, we’ll walkthrough each step of setting up and tracking your content through the Content Strategy Tool. Each pillar page and its corresponding sub-topic clusters require separate mapping strategies. HubSpot will ask you to determine which broad keyword you want your strategy to rank towards. Remember, you should have a web page in mind—or already built out—that will act as the main “hub” for this topic. After you select which topic you would like to focus your pillar content strategy around, HubSpot will help you validate that topic keyword by showing its monthly search volume and overall ranking difficulty. HubSpot will also provide additional recommended topics based on the pillar topic you select, taking into account your existing website pages and your industry vertical. This allows you to consider the overall best core topic for your pillar strategy. If your pillar page is already created, HubSpot will ask you identify the content page related to your selected topic. It is important to remember that your pillar page will be the authoritative source to which your related sub-topic pages link. Make sure this page is built out and properly optimized for success before continuing forward. HubSpot will then prompt you to enter your sub-topics. Like the spokes on a wheel of a bicycle, each sub-topic connects to the pillar content through a hyperlink. Similar to the selection of your core pillar topic, the Content Strategy Tool will provide monthly search results and suggested sub-topics for your keyword. The tool will also deliver a percentage of “topic similarity” as it relates to the pillar topic. The higher the percentage, the closer your selected sub-topic is related to the pillar page’s content. After you select your sub-topic, you again will have to ensure each selected topic correlates with an actual published page on your website. Web pages that work well as sub-topic pages include, but are not limited to: blogs, landing pages and individual product pages. Once you select your sub-topic pages, HubSpot will dynamically analyze each page to confirm they are backlinking to your selected pillar page. If they are properly linked, the connection between your two pages will show up as green. If the sub-topic is not backlinking to your pillar page, the connection between the two will be red. One way you can manually add an internal link is by inserting anchor text in your sub-topic page’s content. Once you have determined your existing sub-topics and their corresponding pages, you can begin to track and monitor the effectiveness of your pillar content strategy. Within the Content Strategy Tool, you can toggle over to the “Content Performance” tab for each one of your topic pillars. This reporting dashboard will feature the total number of sessions across your content topic cluster as well as other metrics. The high-level overview provides marketing insight into which pages are performing the best and what opportunities you may have for future content. Above all else, the HubSpot Content Strategy Tool delivers agile scalability. Your individual pillars should be treated as living, breathing assets of your website. As your marketing team creates and publishes new content, ensure that each blog post or product page fits into your pillar strategy and links back to a pillar page. The Content Strategy Tool can also be used as a research tool, providing recommendations for related keywords, sub-topic ideas and content you have already published that may be interconnected. Falls Digital recommends using additional SEO planning tools, such as SEMRush and Screaming Frog, to inform your pillar strategy research. While HubSpot’s Content Strategy Tool is useful, pillar content strategy transcends beyond current HubSpot users. This strategy is highly recommended for ranking among today’s regimented search engine algorithms. If your organization requires assistance planning your website’s pillar content strategy, reach out to the content marketing experts at Falls Digital. With 10 years of digital strategy and inbound marketing experience, Kristen leads the transformation and customer experience team for Falls Digital. Kristen’s background is rooted in content strategy, buyer persona development and understanding the customer’s touchpoints with a brand—information she uses to develop actionable plans for clients.